Image Zip file containing ASUS Tinkerboard compatible image with latest Linux Linaro operating system Includes pre-installed applications TVHeadend Server, htop, shellinabox and a interactive master menu to easily setup up your network, attached storage, network shares. With the Wi-Fi headless configuration you can also connect your Tinkerboard on boot up to your Wi-Fi network (headless). 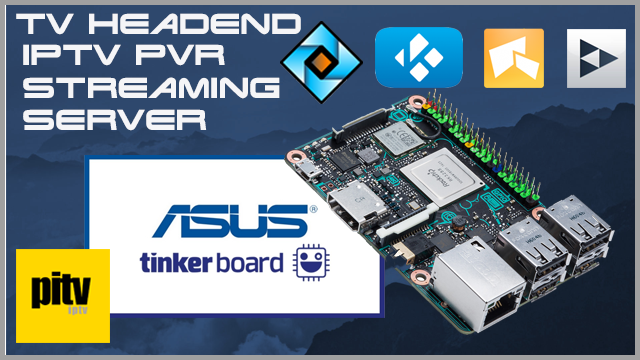 Once purchased and downloaded the extracted image is then written to a MicroSD card and inserted into your ASUS Tinkerboard turning your ASUS Tinkerboard into an instant TVHeadend Server with enhanced features and great configuration support features. Also included: Advanced configuration Menu: ASUS Tinkerboard. Headless Wi-Fi setup (no need for xterm) connects your ASUS Tinkerboard automatically to the preferred Wi-Fi network by simply editing and existing file on the dos partition before inserting it into your ASUS Tinkerboard. The advanced configuration menu easily configures the ASUS Tinkerboard network and storage by simply selecting a option from the interactive network menu then answer basic configuration questions. After simple menu driven configuration a quick reboot provides the mounted drives or shares for access. 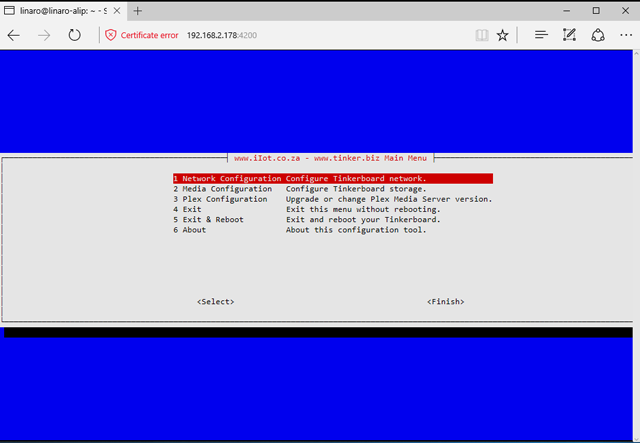 Network Configuration - Configure Tinkerboard network. 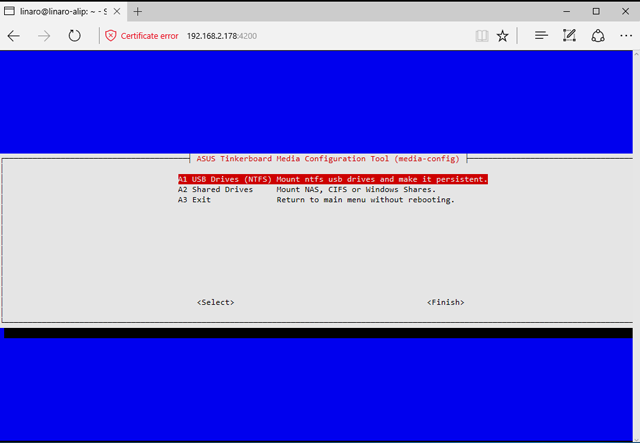 Media Configuration - Configure Tinkerboard storage. Exit & Reboot - Exit and reboot your Tinkerboard. Install Wireless AP - Setup Tinkerboard onboard Wi-Fi Access Point. Install Wireless client - Connect Tinkerboard to a Wi-Fi network. 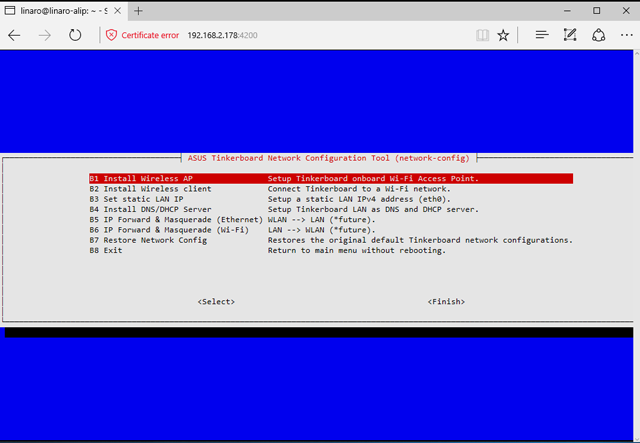 Install DNS/DHCP Server - Setup Tinkerboard LAN as DNS and DHCP server. Restore Network Config - Restores the original default Tinkerboard network configurations. 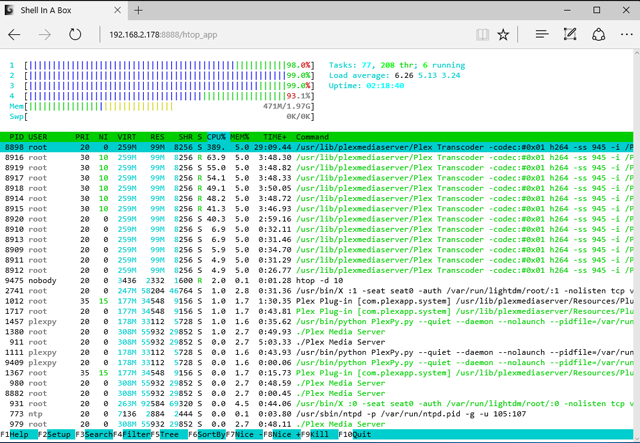 Htop is an interactive system-monitor process-viewer. It is designed as an alternative to the Unix program top. It shows a frequently updated list of the processes running on the ASUS Tinkerboard, normally ordered by the amount of CPU usage. Htop is enabled by default and instructions include option to disable and remove the program if required. 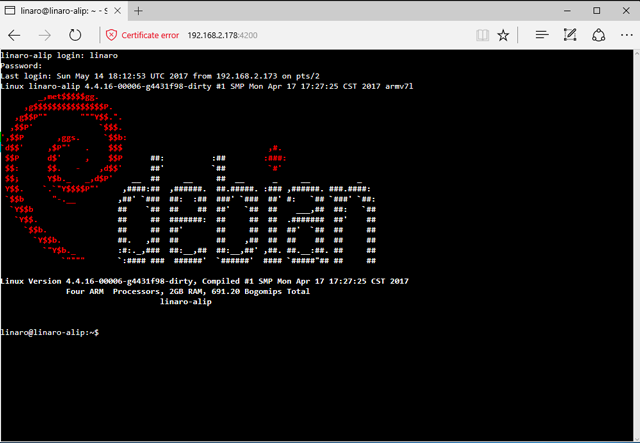 Shellinabox is a web based terminal that uses Ajax technology to provide the look and feel of a native shell. Using this, as long as your device has a browser, you can remote shell access your ASUS Tinkerboard. (remote view of htop using shellinabox is pre-installed). As with Htop, Shellinabox is also enabled by default and instructions include option to disable and remove the program if required. 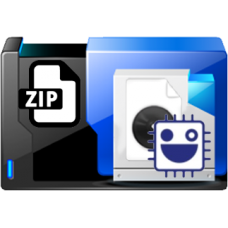 Download the zip file from your account downloads section. Unzip the image file using your favorite unzip tool. Write the image file to a MicroSD card using your favorite image writing tool. ASUS Tinkerboard and boot / Power it up. Ensure your ASUS Tinker board is connected to a a Network. cat /etc/issue to view your IPv4 address, list of URL's and additional instructions. When you first access TVHeadend setup language and a user and password of your choice. Login to your TVHeadend server with the URL provided, typically http::9981. Goto Configuration -> DVB Inputs -> Network, click Add button to add a network. From the network type dialogue window select IPTV Automatic network from the drop down selection. Give your network a name, can typically be anything you like to call it. streams(multiroom for PITV) by your service provider. If you have subscribed to PITV or any other provider paste the m3u url in the URL box. Choose and enter a provider name (can also be anything that best descibes your provider). Under Advanced settings, uncheck Scan after creation option. Next, under the Exper settings section, choose your UTC time offset, for South Africa it will be UTC +2. Change the Service ID from 0 to 1 then click the create button of the open Add IPTV Automatic Network dialouge window. go back and do this now then repeat the steps above again. You should now see a number of channels listed. Goto Configuration -> DVB Inputs -> Services, click the Map Services drop down. You can cherry pick what services to map or map all services. Map encrypted services and Check availability then click the map services button. The Service Mapper dialouge window will now appear and your selected services will be mapped. Next goto Configuration -> Channel / EPG -> EPG Grabber and click the re-run internal EPG Grabbers button. Finally go to the Electronic program guide, all your channels should now be visible as well as all the EPG data. TV Headend app is available for IOS and Android and is also supported as a PVR for KODI. • Pre-installed HTS Tvheadend 4.3-734-g4433c27d8. • Enabled FTP service. provides simple ease of access to transfer media to and from the ASUS Tinkerboard. • Bonus tools downloads (if selected).